i7-8086k is showing up for sale... Probably good for collectors and those not wanting to mess with OC but most everyone should get the same from 8700k. If truly higher binned, then might be worth it. That I think might be hard to find. A few days ago we covered the what appeared to be the Threadripper 2990X in all its 32-core glory and there was one part that had been blurred out. Well, the original screenshot has just surfaced (Mobile01 via KOMACHI’s twitter account) and was actually the upcoming Intel 8-Core Coffee Lake-S flagship processor. The Cinebench score of the part was also revealed as a result. Intel’s Coffee Lake-S 8 core / 16 thread mainstream flagship scores 2212 points in leaked Cinebench score (Engineering Sample). Even though the timeline for this leak lines up perfectly what with the AoTS leak and the fact that we originally heard the Z390 refresh platform officially detailed, I would still urge a pinch of salt with this leak considering it comes from an unknown source (Mobile01) and the “Genuine Intel CPU 0000” could potentially correspond to some other SKU entirely. Komachi also previously spotted the Coffee Lake S 8-core variant in the AoTS database so it’s not entirely surprising that we are seeing more leaks of the same part pop up. In fact, if anything it lends credence to this leak. We aren’t sure of the exact launch date for the processor right now but rumors have pointed to a launch as soon as by the end of the year. Some other rumors pointed to an early 2019 launch date but considering we are already seeing ES variants pop up, this might be sooner rather than later. Keep in mind, however, that this is almost certainly an engineering sample and clocks aren’t finalized yet – in fact, this particular ES seems to have a base clock of ~3 GHz which is the same as the one we saw in Ashes of the Singularity benchmark. A score of 2212 is already pretty impressive and this could increase even further depending on how much Intel is able to tweak the CPU. The per-core scaling we are seeing here compared to the Threadripper 2990X also corresponds with what we have seen in the past with Intel have a core-for-core advantage but falling back in the overall numbers department. Threadripper 2nd Gen is going to improve a lot on the clock performance of the platform and Intel will have to compensate in a similar fashion. All we can say right now is that its good to see x86 competition heating up again. This quite handily bests the Ryzen 2700X with some ease. Especially considering it's an ES, but we kinda expected this right? I really love the back and forth... Rumors of 2800x is they are waiting for the 8 core Intel release. I read that the z370 might not be compatible and like you have posted, the z390 or something would be needed. Possibly the 2800x will be 10 core since the clocks are not going to be that high. They can't do a 10... they didn't redesign the arch, just put it on a new process and made some minor tweaks. They could do a 10 core on the X399 platform I suppose but that would put it outside the price bracket of the mainstream. Zen 2 will have to be the next counterpoint. AMD are now dumping Gen 1 Threadrippers so they can get ready for the Gen 2 ones. Also means the resale value of Gen 1 threadrippers will be destroyed for those who bought early. Highly anticipated: While most people are waiting impatiently for the arrival of Intel’s 9thgeneration Coffee Lake-S Refresh processors—rumored to launch in October—some users have already got their hands on engineering samples and are showing what the chips are capable of. Back in July, we saw Core i9-9900K benchmarks that put the CPU ahead of the Ryzen 7 2700X and i7-8700K. Now, an i7-9700K purportedly overclocked to a massive 5.5GHz across all eight of its cores has been spotted. The i7-9700K is said to feature 8 cores and 8 threads—hyperthreading will be an exclusivefeature for the top-end Core i9 series. Built on the 14nm++ process, it has a clock speed of 3.6GHz and can boost to 4.6GHz on all cores, or 4.9GHz using a single core. It also boasts 12MB of L3 cache and a TDP of 95W. Chinese-language site ZOL has posted screenshots of the chip being used. It shows the i7-9700K running on an ASRock Z370 Professional Gaming mobo with 16GB of G.Skill DDR4-2133 RAM. Another image shows the CPU’s Cinebench R15 benchmarks. The i7-9700K has been overclocked to 5.5537GHz across all eight cores, and that’s apparently using water cooling rather than liquid nitrogen. It attained a single-core score of 250 and a multi-core result of 1,827, though the overclock had the voltage set at 1.536V, which is high. The scores put it above the Core i7-8700K (stock), which managed 193 and 1408. It’s also slightly better the Ryzen 2700X—AMD’s chip attained scores of 250 and 1827, though that was also at stock speeds. As with all leaks of this kind, it’s best taken with a pinch of salt, particularly as the date in the BIOS image is months out from the one in the Windows taskbar. Expect to discover the 9000-series' exact performance capabilities when the chips are released in a few weeks' time. I guess you don't need to add a new video card either as the Vega would be fine. Bu the heat sink would be flipping huge. The top-of-the-line Core i9-9900K, an eight-core, 16-thread CPU with a top clock speed of 5Ghz, hit a single-core score of 6,248 and raked in a healthy 33,037 in the multi-core test. These figures appear to trounce those any stock Ryzen 2 chip can achieve out of the box. The Core i7-9700K, an eight-core CPU with the same number of threads, also puts in an excellent showing, hitting 6,297 in the single-core test and 30,152 for the multi-core score. 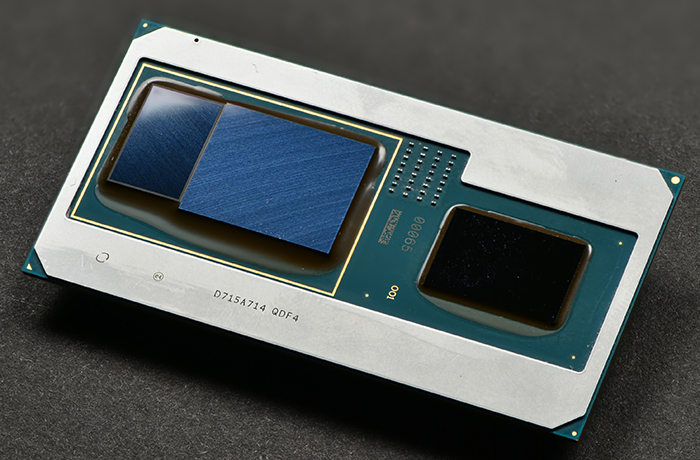 The last chip in the leaked benchmarks is the Core i5-9600K, a six-core chip clocked at 4.6GHz. It manages to get 6,027 points in the single-core test and collect 23,472 points in the multi-core test. These are all pretty decent scores that indicated a decent hike in performance over the eight-gen chips, arguably more than we'd been expecting. The Core i9-9900K looks to be the most impressive chip as it has a nippy boosted clockspeed and repeatedly offers some 4.7GHz across all cores from a thermal design power of 95W. Such benchmarks are all very well and good but real-world performance is where it's at. Helpfully for us, though not Intel, performance of the Core i7-9700K in review tests seems to have been published early by Elchapuzasinformatico, hat tip to WCCFtech. The processor was found to outclass rival and last gen Intel chips in games like Battlefield 1 and Doom. Some might argue that these aren't the most demanding games around, but they can tax a processor and show any flaws it might have in putting performance into effect. Only in tests that favour multi-core tests, such as the Cinebench R15 benchmark do rival CPUs like AMD's Radeon 7 2700X pull ahead, but that CPU is a part with more threads and is very capable at rendering tasks. I'd love to build a 9900K system for home. So what do we think of the 9900k? It didn't really wow did it? I'm running into the limitations of my Intel i7 6700 in my Dell at work already but I think I can't justify a 9900K in a new PC as yet. I love how Intel says that the 9900k was always coming and it's not in response to Ryzen. I think Ryzen forced the 9900k to be released earlier than they wanted. Yeah... by about 5 years! Thanks. I read a brief piece about them on the train during the week, but forgot to find something a bit more in-depth to see if it's worth investing in a new desktop next year on this new platform. No worries. It seems that while the last three generations have been basically Skylake, this is actually new. Intel are calling it a 'clean sheet' design, but some are saying it looks liked optimized Skylake.